In this photo I was at the half done stage. I got to this point by midnight on Saturday March 17. Considering I started it around noon on Friday March 16th not bad progress pretty simple straight forward pattern. There are a few things I would change if doing it again like one color like the original ( but I was trying to use up scrapes so it is ok). Use natural fibers such as silk, or cotton, or wool or linen instead as I am not to fond of synthetics at all. Also I think I would add two stitches to the center part one on each side of the repeat that would be slipped at the beginning of each row this would make for easier casting on for the yoke and peplum bottom. 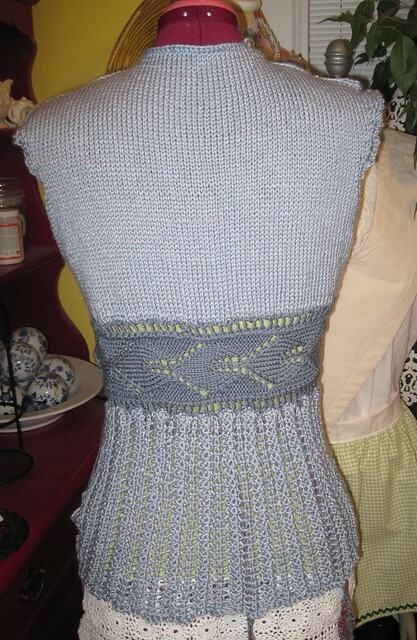 There is an error in the pattern but I did not notice till after I had done the waistband and attached the top and bottom of the back so it is going to stay. There are two rows of pattern missing between the leaves doesn't effect the overall item much but the leaves run together which they should not.